Hello and welcome to Day Six of our March Rubber & Die Release Showcase! On Wednesday (21 March) Whimsy Stamps released this month’s rubber designs, new Shapeology dies and new Shape EZ templates. From then until 27 March the Whimsy Stamps DT and Special Guests are showcasing these fabulous new goodies with a daily mini blog hop and I am part of today’s hop! To be entered into today’s mini blog hop prize draw, be sure to leave a comment on ALL of the DT’s posts listed below by 12.00PM EST tomorrow. All winners will be announced on the Whimsy blog on 28 March. For my sample today I chose the darling Pixie Dust Fairy. It was stamped iin Tuxedo Black Memento Ink on Neenah Solar White cardstock, cut out with the Out of the Box technique and a Standard Circle Nestabilities die and colored with Copic Markers (Skin: E000, E01, E02, BV000 Hair/Pixie Dust: YG01, YG03, YG17 Ribbon/Pot: Y11, Y13, Y15, W2 Dress/Shoes: C00, C1, C3 Wings: YG0000, YG00, YG01 Background: B0000). The circle was adhered to a piece of Solar White cardstock that had been cut and embossed with the largest gorgeous new Spendid Circle die. A 4 3/16″ square of white cardstock was cut and embossed with the new Flower Fun M-Bossabilities folder that had been inked up with New Sprout Memento Ink. The layer was stitched to a 1/4″ bigger piece of Sour Apple cardstock. May Arts ribbon was threaded through on of the holes in the Splendid circle before the circle layers were adhered to the embossed squares with dimensionals. The ribbon was tied to a bow and a button was tied on that with embroidery floss. The layers were adhered to the card base which was cut with a Grand Scallop Square Nestabilities die out of Solar White cardstock. Another piece of white cardstock was cut and embossed with the second smallest Splendid circle die. A sentiment from the Friendship Ticket Sentiments was stamped in the center and the circle was airbrushed with Copic Marker B000. The circle was adhered to the lower right of the image layer. Lime Twist Smooch Glitz was added over the hair and pixie dust, Frost Smooch Glitz over the wings. Fancy That! Border Bling was adhered to the upper left corner and part of a Finesse Rhinestone Swirl was adhered to the lower left. love it what a cute card. Very cute–great coloring and I like the splendid circle die. This is so beautiful, Beate! I love the colors, layers and diecuts! Darling image which you’ve colored wonderfully! 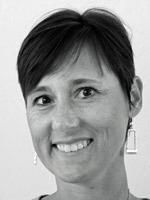 Adorable Beate!! Your cards are such a joy to see! Very pretty card! Great coloring! Loved the stamp and the Splendid circle die used! So beautiful! Love the color combo you used here! Great textures with the embossing! Gorgeous card! You always amaze me 🙂 I love this image too! This is so pretty!! Love the bow with the button!! Deine Karte sieht wie immer toll aus. Der embosste Hintergrund sieht toll aus und auch die Dies gefallen mir sehr. Das Motiv ist wieder liebreizend und wie immer toll coloriert. How cute! I love all of the green and that pretty bow! Beautyful colors. Fantastic result. I love it. This is really pretty and what really grabbed my attention was the awesome base layer that you embossed. A lovely spring-y card! So sweet colors. Oh what a darling card Beate,beautiful colours! Really lovely card. Super image and love the colours used. Wiosna w pełnym rozkwicie . Oh so cute! Love the green hair! That just puts it over the top! WOW! So beautiful card!! love the colors. 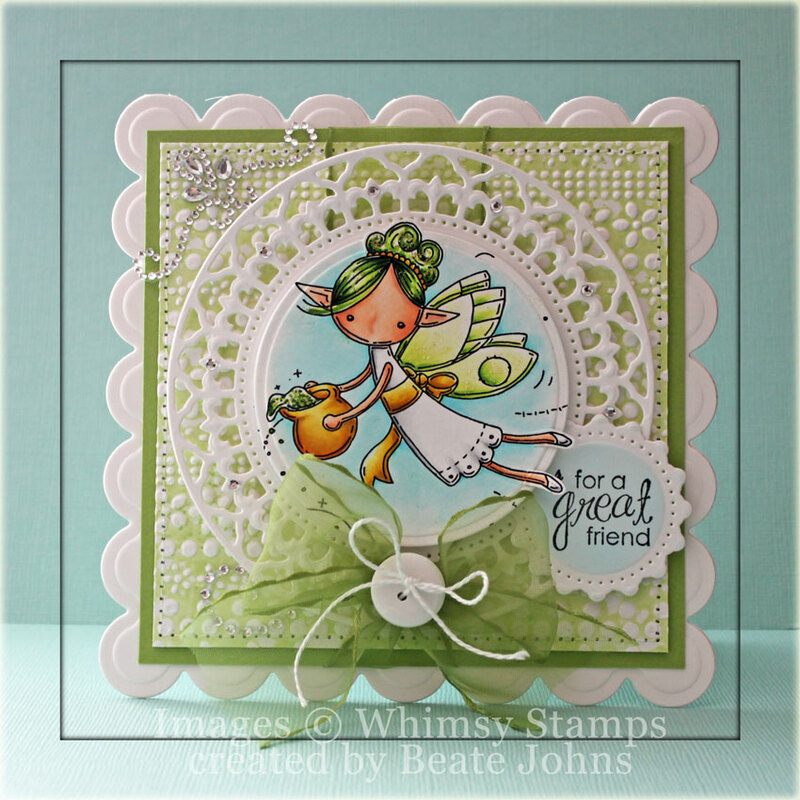 Beate your coloring is gorgeous and the texture on the Dp is fabulous! I love the design, ribbon and colors too! Thanks for joining us! Gorgeous! The inked M-Bossabilities you used for your background is beautiful, as is your coloring. Love all the shaped layers, especially the splendid die cut. Another great image and card. Love the faux letterpress layer, so pretty! Wow, love this card, great M possibilities and the splendid circle, I love the airbrushing and your coloring, the whole card is awesome. this is too, too cute. I love the soft but zingy greens with white, so clean and fresh like buds of spring flowers. Such a cute card. I just love your layout. Thank you for sharing. Beautiful colors, the stamp is so cute ! So many details and so meticulously done, Beate. Oh my goodness, what cute images you are showing us this week! Thanks for sharing another gorgeous card, Beate! You are amazing, my friend! (and so is your Spellbinder collection!!!) Have a great day! As always, I love your coloring! The green really stands out and makes this card! very cute, loving this color green and that embossing folder and die are so pretty together! I love the background embossing and color. a darling image, and lovely accents. thanks for sharing. such a sweet card! Love the greens and all your shapes are amazing! Great job! This is adorable, Beate! Fabulous coloring as always! LOVE her green hair! LOVE it!